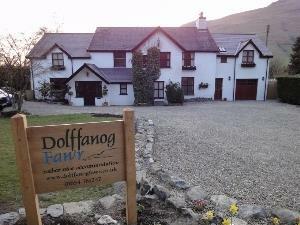 Dolffanog Fawr01654 761247work Guest AccommodationDolffanog Fawr is an 18th century farmhouse that has recently been thoroughly renovated and converted into one of the finest small accommodation establishements in Snowdonia. The house offers truly luxurious accommodation in the stunning Tal-y-llyn valley in the heart of the Snowdonia National Park. It is located at the foot of Cadair Idris and overlooks Tal-y-llyn lake. The bedrooms are beautifully furnished with large top of the range pocket sprung beds, egyptian cotton bedding, handmade contemporary welsh lambswool throws and recently refurbished bathrooms. Alex and Lorraine serve very special home cooked meals using the best local produce and have an extensive good value wine list to match. Exceptional levels of comfort and hospitality are guaranteed. We have achieved the prestigious Visit Wales Gold Award for the past 5 years. Dolffanog Fawr is an 18th century farmhouse that has recently been thoroughly renovated and converted into one of the finest small accommodation establishements in Snowdonia. The house offers truly luxurious accommodation in the stunning Tal-y-llyn valley in the heart of the Snowdonia National Park. It is located at the foot of Cadair Idris and overlooks Tal-y-llyn lake. The bedrooms are beautifully furnished with large top of the range pocket sprung beds, egyptian cotton bedding, handmade contemporary welsh lambswool throws and recently refurbished bathrooms. Alex and Lorraine serve very special home cooked meals using the best local produce and have an extensive good value wine list to match. We accept well behaved dogs and children over 7 by prior arrangement. We also offer special short break rates of £73pppn (dinner, bed and breakfast) for stays of 3-4 nights and £70pppn (D,B&B) for 5 or more nights. Garden hot tub available for guests Children welcome from age 7. Overlooking Tal-y-Llyn lake, find us on the B4405, just off the A487 between Dolgellau and Machynlleth. Access statement for Dolffanog Fawr Grid Ref:729104 General •	Dolffanog Fawr is a small Country House Bed and Breakfast that offers evening meals to residents and is located just off the B44409 near Llyn Mwngil at Tal-y-Llyn. •	The House has a gravelled parking area for six cars, there are no steps between the parking area and the front door. •	The House is approximately 10 miles from the nearest towns of Dolgellau, Tywyn and Machynlleth. Public transport links have been severely reduced in recent years. •	A porterage service is available if required. •	There is a unisex downstairs toilet located just off the entrance hall. •	There is no mobile phone coverage in the house although we do have a public payphone. •	All doors have a minimum width of 750mm and the floors are level throughout the ground floor. •	Assistance dogs are allowed throughout the house, including the dining room and garden. Bedrooms •	All bedrooms are located on the first floor via a flight of 14 steps. There is one hand rail on the left and a wooden dado on the right. •	All bedrooms have been re-decorated with plain matt emulsion walls and contrasting carpets. •	All doors are fitted with lever style handles. •	All bedrooms have colour televisions and freesat boxes offering sub-titles and teletext. •	All bedrooms have en-suite facilities although the bathroom for bedroom 2 is down a flight of 3 steps. Meals •	All meals are served on a large communal table at one sitting. A separate table is available if required. •	All dietary requirements can be catered for, provided we know in advance.